Amnesty International stories at Techdirt. Amnesty International has been heavily engaged in fights against mass surveillance, recognizing that many of the people it communicates with need an expectation of privacy in their communications with the group. Last year, Ed Snowden revealed that the NSA specifically spied on Amnesty International and other human rights organizations. And, while Amnesty International was unable to gain standing by the US Supreme Court, since it couldn't prove that the NSA had spied on its communications, the story appears to be somewhat different over in the UK. Last year a legal challenge was filed in the UK via the Investigatory Powers Tribunal (IPT) concerning Amnesty International. And now, the group has been informed that, yes, it was spied on by GCHQ in the UK. 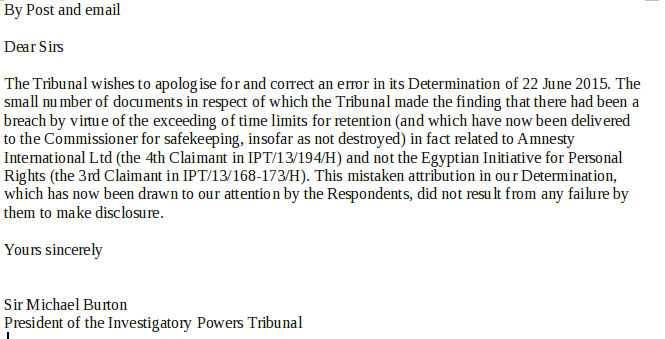 As you may recall, a little over a week ago, the IPT had ruled that the GCHQ had erred in holding onto emails too long -- but had named that Egyptian organization as the one whose emails were held. However, that's now been corrected to Amnesty International. Both issues raised here are significant. The only reason Amnesty now knows about this is because GCHQ held onto the emails too long. If it had done its usual purge, then the IPT likely would never have revealed that, and Amnesty's communications would have continued to go on being compromised without anyone knowing. For a while now, we've been covering various legal challenges in Europe related to the GCHQ's surveillance activities. One of the main cases, brought by Amnesty International and Privacy International, argued that the surveillance violated the European Convention on Human Rights (specifically article 8, on right to privacy, and article 10, on freedom of expression). While it was always expected that the case would eventually go to the European Court of Human Rights, the first step was the Investigatory Powers Tribunal in the UK -- a secretive court that reviews complaints about surveillance, but (as with nearly all "secretive courts" charged with "oversight" on the intelligence community) almost always sides with the intelligence community. Between 2000 and 2012 the IPT only sided against the intelligence community 10 times out of 1468 cases brought (about half of one percent of all cases). In other words, this is a court that (in secret) regularly okays GCHQ's surveillance efforts on UK citizens. Independent body? Right. It's the "independent" body that has a history of saying the very actions now being scrutinized are perfectly fine. It may be "independent" of the GCHQ itself, but it's not "independent" of the surveillance GCHQ carried out. The groups who brought this case say that they'll appeal to the European Court of Human Rights, which is what everyone expected to happen in the first place. This little rubber stamping by the IPT was just a procedural issue that had to be taken in the first place. This probably won't come as a surprise to anyone, but the Supreme Court has completely shot down the ACLU (and some activists and journalists') attempt to invalidate the part of the FISA Amendments Act that "legalized" warrantless wiretapping. As we guessed at the time of the oral hearings, it seemed like it was going to be difficult to convince a majority of the court that the plaintiffs had any standing to complain, since they couldn't show that they had been directly impacted. And, indeed the court ruled 5 to 4 that there was no standing here. So, basically, there is simply no way to challenge the constitutionality of warrantless wiretaps. Doesn't that seem like a serious constitutional problem? The government can pass laws that it can spy on people in private, and there's no way to then challenge that law. Oh, and if you happen to discover (by accident!) that you've been spied upon the government can just claim sovereign immunity, and that's it. Case closed. The full ruling is pretty depressing. The court basically says any harm is "speculative," and thus there can't be any standing at all. We decline to abandon our usual reluctance to endorse standing theories that rest on speculation about the decisions of independent actors. If the law were otherwise, an enterprising plaintiff would be able to secure a lower standard for Article III standing simply by making an expenditure based on a nonparanoid fear. Perhaps a legitimate concern, but it still seems somewhat ridiculous that there is no actual way to test the constitutionality of a law that clearly has 4th Amendment consequences. The dissent pointed out that it's crazy to suggest that the fact that this will be used on the plaintiffs was "speculative," and clearly worried about the implications of such a ruling and what it means for the government's ability to pass these kinds of laws without real judicial review. The upshot is that (1) similarity of content, (2) strong motives, (3) prior behavior, and (4) capacity all point to a very strong likelihood that the Government will intercept at least some of the plaintiffs’ communications, including some that the 2008 amendment, §1881a, but not the pre-2008 Act, authorizes the Government to intercept. At the same time, nothing suggests the presence of some special factor here that might support a contrary conclusion. The Government does not deny that it has both the motive and the capacity to listen to communications of the kind described by plaintiffs. Nor does it describe any system for avoiding the interception of an electronic communication that happens to include a party who is an American lawyer, journalist, or human rights worker. One can, of course, always imagine some special circumstance that negates a virtual likelihood, no matter how strong. But the same is true about most, if not all, ordinary inferences about future events. Perhaps, despite pouring rain, the streets will remain dry (due to the presence of a special chemical). But ordinarily a party that seeks to defeat a strong natural inference must bear the burden of showing that some such special circumstance exists. And no one has suggested any such special circumstance here. They go on to point to a series of other cases where standing was granted based on "probable" injury. It also notes a bunch of scenarios that seem ridiculous, but which are logically implied by this ruling. And, indeed, the standard the Supreme Court ruling makes here is a very high bar that is going to deny standing in many cases, and often allow the government to act with impunity in cases where oversight is needed. This is very unfortunate. And, of course, it's unlikely that Congress will do its job and step in to fix this.